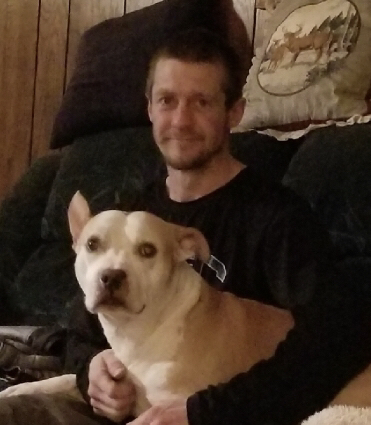 Cameron Schnelle, 39, of Rothschild, passed away Wednesday, October 24, 2018 at Marshfield Hospital, due to complications with asthma. Cameron was born April 22, 1979 to Wayne and Diane Schnelle. Cameron was a good man who had a heart of gold. When someone needed help, he was the first person to call. Like his dad, he was a jack of all trades- master of none. In addition to his parents, Cameron is survived by his sister and brother-in-law Theresa and Brad Heckert, niece Sierra Heckert, nephew Dylan Heckert, great niece Lucy Heckert and Grandmother Jenny Schnelle Maszk. He is also survived by many aunts, uncles and cousins. He was preceded in death by his grandparents Vi and Speedy Ballard and Gilbert Schnelle. Aunt and Uncles Judy & Richard Hull, Teddy Ballard Sr., and James Schnelle. Six months ago, Cameron also lost his best buddy of 8 years- his dog Snoop. Cameron and Snoop have now been reunited and will never be apart again. We want to thank all the doctors and nurses in the ICU at Marshfield Hospital for their outstanding care provided to Cameron, especially his two nurses Jon Small and Rachel Heier, who went above and beyond. Cameron was an organ donor and has literally saved the lives of 5 people. The head surgeon from UW-Madison said “Cameron is a hero!” We also want to thank the staff and surgical unit from UW-Madison Organ Donation for their loving care of Cameron and compassion and loving support they extended to us. Memorial services will be held Sunday, November 4th at 12:30 p.m. at Brainard Funeral Home’s Everest Chapel, 5712 Memorial Court, Weston with visitation starting at 11:00 a.m. In lieu of flowers, memorials can be made out to UW Organ and Tissue Donation.